DaVinci Gourmet Sugar Free Chai Tea is a soothing combination of black tea and spices like cinnamon, vanilla, clove, and ginger. Preparation is simple with this easy-to-use concentrated formula. Sweetened with sucralose (Splenda brand). At 0 calories per serving, you can enjoy chai guilt-free. Also available in regular. One case = 12 750ml glass bottles. Chai Tea Latte - Add 3 pumps (3/4 fl oz) of DaVinci Chai Tea Concentrate to 7 fl oz of steamed milk or milk substitute. Stir & enjoy! For a cool treat, simply pour over ice. For an extra boost, add a shot of espresso. 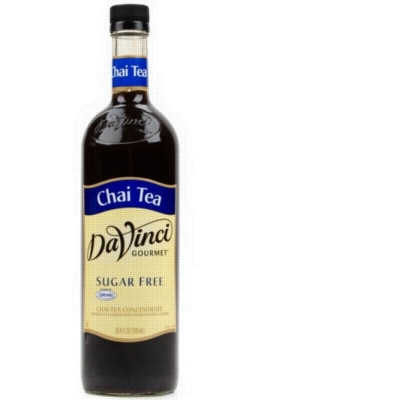 Chai Iced Tea - Add 3 pumps (3/4 fl oz) of DaVinci Chai Tea Concentrate to 7 fl oz of water and pour over ice. Stir & enjoy!